Photo by Martin de Witte. Coastal ecosystems are severely stressed in many parts of the world as a result of overpopulation, intense coastal development, urbanization, spiraling resource use, pollution, and the spread of invasive species. Climate change is expected to exacerbate these stressors and is considered by many to be one of the most important challenges facing the world in the 21st century. Monitoring of marine mammals provides a window into global trends in persistent organic pollutants (POPs) concentrations that are occurring as a result of changes in climate, the use patterns of industrial and agrichemicals, and reduced biodiversity in the oceans. Marine mammals accumulate high concentrations of POPs because of their high fat content and because many species of cetaceans and pinnipeds occupy the very top of the marine food chain. In some areas of the world, POPs can impact human health as a result of the consumption of traditional or “country foods”. Such wild game can include marine mammals (beluga whale, seal, walrus, narwhale, bowhead whale, etc. ), as it does for Canada’s indigenous peoples living in and near coastal areas. Dr. Chris Metcalfe — Director of the Institute for Watershed Science at Trent University in Canada and Senior Research Fellow with the UNU Institute for Water, Environment and Health — answers questions on this consequential topic. Q: Can you please give us a brief overview of what persistent organic pollutants (POPs) are? POPs are man-made chemicals that do not disappear rapidly once released into the environment; they tend to accumulate in food chains, potentially causing health problems in organisms at the top of the food chain, including humans. In some cases, chemicals like PCBs have persisted for several decades after they were banned from use. The Stockholm Convention originally identified 12 POPs (i.e., “the Dirty Dozen”) for elimination globally, and 185 countries have ratified this agreement. Recently, another 9 classes of POPs (i.e., “the Nasty Nine”) were identified for elimination. Unfortunately, among these latest POPs recognized under the Stockholm Agreement, several countries are exempt from the controls. Q: Why are POPs concentrations particularly high in marine mammals? Marine mammals tend to have large reserves of fat or blubber. Since most POPs have a propensity to accumulate in fat, marine mammals are prone to accumulating large amounts of these compounds. In addition, marine mammals tend to be at the top of marine food chains and so there is opportunity for POPs to “biomagnify” from the bottom of the food chain (e.g., plankton) to the top. Finally, because marine mammals nurse their young with fat-rich milk, they start out their life with an unhealthy dose of POPs as a result of “lactational transfer” of contaminants from other to young. Q: Which populations of marine mammals have the highest levels? 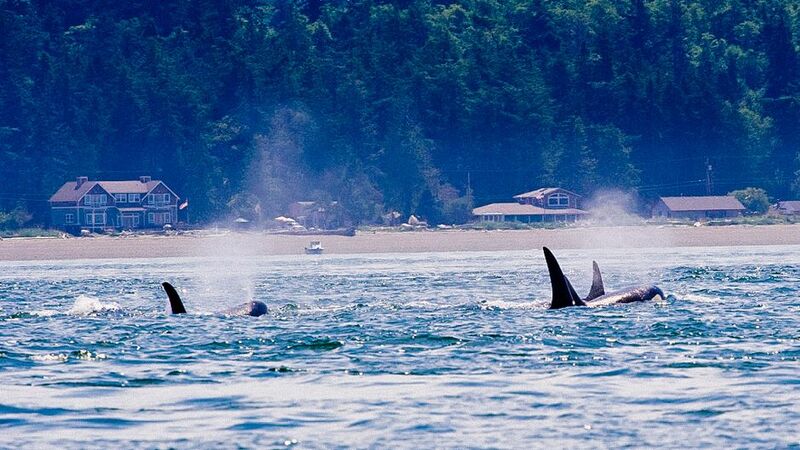 The killer whales that live along the Pacific coast of British Columbia in Canada and the State of Washington in the United States are now recognized as the most contaminated animals in the world. This is especially true for the population of “transient” killer whales that pass through this region and typically feed on other marine mammals, such as seals. Close behind these populations in terms of POPs contamination are the beluga whales that live in the St. Lawrence estuary in Canada and the seals that inhabit the Baltic Sea in Europe. Q: Is there evidence that POPs are present in some marine mammals at concentrations that may be affecting their health? There is a growing body of evidence that high levels of POPs in the tissues of some marine mammals is leading to reduced reproductive success, elevated rates of gastrointestinal cancers and increased susceptibility to infectious diseases. Q: What about humans? Who is impacted, and how they are being affected? Human populations that rely on consumption of marine mammals for their livelihood are especially susceptible to potential impacts from POPs. There is some evidence that there are health effects in indigenous coastal communities in Canada’s north and a population in Denmark’s Faroe Islands that consume marine mammals. Possible effects include susceptibility to infectious diseases and subtle-but-measurable effects on cognitive development in children. Q: Is the Stockholm Convention helping — are POPs concentrations going up or down in marine mammals? The concentrations of POPs — at least the original “Dirty Dozen” — are slowly declining in marine mammals around the world. It is not always clear that this is a result of declining POPs in the world or whether it is due to dietary changes as a result of global change. For instance, declines in POPs levels in the St. Lawrence beluga may have more to do with the decline of the North American eel (a favourite and fatty food of belugas) in the St. Lawrence and Great Lakes system. Q: How are global changes affecting POPs? Is climate change playing a big role? There is some evidence that climate change is affecting the distribution of POPs in the atmosphere and the release of POPs bound up in glacier ice, but it is too early to tell if this is affecting POPs levels in marine mammal. There is evidence that suggests that climate change can alter food sources, trophic structures and migratory patterns of marine mammals, which will influence biomagnification and accumulations of some POPs. Since warm-blooded animals are highly affected by ambient temperature, the toxicity of POPs can either increase or decrease with increasing temperatures. There is some concern that the polar regions will be particularly affected by climate change. We also know that in these regions the levels of POPs found in some of the higher trophic-level marine species (such as polar bears and toothed wales) are extremely high, so the largest concern for interactions between climate change and POPs is in these higher trophic-level marine mammal species (Noyes et al., 2009, and Letcher et al., 2010). Q: Can you please summarize UNU-INWEH’s work in this area? UNU-INWEH has not been involved in analysing POPs in marine mammals. However, we recently completed a project that ran in 2007–2010 titled the Caribbean Coastal Pollution Project (CCPP). The CCPP was funded by the World Bank through the Canada Persistent Organic Pollutants Fund of the Canadian International Development Agency. The project included eight countries: Belize, Guatemala, Honduras, Mexico, Dominican Republic, Jamaica, St. Lucia and Trinidad & Tobago. Past assessments and studies show that pollution by POPs is of ecological and human health concern in coastal environments of the wider Caribbean countries, but that there is a lack of knowledge and capacity to monitor and manage these contaminants. UNU-INWEH commenced the CCPP with two Canadian partners and 16 partners in the region to address this issue. It aimed to assess levels of POPs in a coastal fish species (like the white grunt) and to develop capacity for POPs monitoring in marine resources in the Caribbean. We are currently waiting to hear whether we will contribute to a Global Environment Fund-funded project to continue working to control POPs in the Caribbean and Latin America region. Q: The UNU Institute for Sustainability and Peace, with the support of Shimadzu Corporation, has been assisting developing countries in Asia to monitor and manage POPs by providing scientific training and technology since 1996. Do you have any comment on the work/outcomes of the project Environmental Monitoring and Governance in the Asian Coastal Hydrosphere? This Asian hydrosphere project actually formed the basis for the discussions on developing the CCPP project back in 2006. UNU-INWEH’s Director, Dr. Zafar Adeel (who used to be based in Tokyo), was involved in this POPs hydrosphere project in the past and initiated discussions on possible coastal POPs pollution projects in other regions. I recently visited one of the labs at the University of Hanoi in Vietnam that was supported by this project. I can say that they have a high level of competence in conducting monitoring programsme for POPs and other contaminants as a result of the past support from UNU and Shimadzu. They are particularly interested in expanding their capacity to analyse for the “Nasty Nine” classes of POPs — an area where UNU-INWEH could help. Persistent Organic Pollutants in the Marine Food Chain by Chris Metcalfe is licensed under a Creative Commons Attribution-NonCommercial-ShareAlike 3.0 Unported License. Chris Metcalfe is Senior Research Fellow with the Water-Health Nexus of the UNU Institute for Water, Environment and Health (UNU-INWEH) and a Professor in the Environmental and Resource Studies Program at Trent University in Peterborough, Ontario. Dr. Metcalfe is also currently the Director of the Institute for Watershed Science at Trent University. Working in partnership with UNU-INWEH, this institute is currently developing capacity for protecting sources of drinking water in remote Indigenous communities in Canada’s north. His previous experience includes leading watershed management projects in Mexico and Ecuador and working to increase research and ecosystem management capacity within institutions in Indonesia, Cuba, Argentina and the Caribbean region.